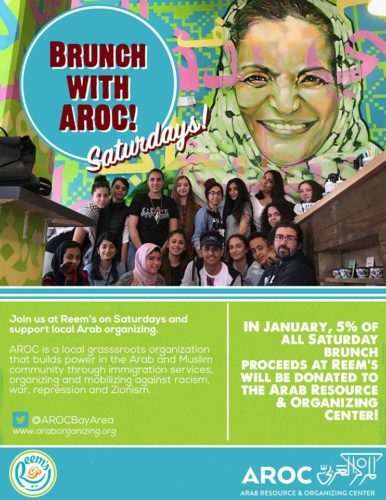 In January, 5% of all Saturday brunch proceeds at Reem’s will be donated to the Arab Resource & Organizing Center! Join AROC at Reem’s on Saturdays and support local Arab organizing! AROC is a local grasssroots organization that builds power in the Arab and Muslim community through immigration services, organizing and mobilizing against racism, war, repression and Zionism.